Effective weather spotter reports are a critical component of National Weather Service severe weather operations. 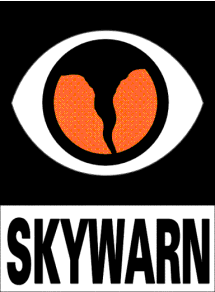 NWS meteorologists use science, technology, training, experience, and spotter reports when making warning decisions. An effective spotter report is one that is timely, accurate, and detailed. Spotters should use the following guidelines when reporting: Follow the specific reporting guidelines for your area. Remain calm, speak clearly, and do not exaggerate the facts. If you are unsure of what you are seeing, make your report, but also express your uncertainty. Immediate, real-time reports, are most helpful for warning operations, but delayed reports are also important, even days after an event. Delayed reports are used for climatological and verification purposes. Weather events should be reported according to the instructions provided by your local NWS office. Here are some general guidelines on what to report. What damage did you observe? How long was it on the ground? When did it start and end? How wide was it? How far did it travel (if known)? Report flooded roadways, rivers and streams, giving approximate water depth. Does the flooding consist of standing water or is it flowing? Is the water level continuing to rise, staying steady or falling? Is the flooding occurring in a known flood prone area? Any damage from the flooding or mud slides? Report if clouds are rotating and how long they have existed. Watch for organization, persistence and rotation. Only report lightning when damage or injuries occur. Report any occurrence of freezing rain, ice accumulation and damage. How much heavy snow accumulation is there and is there any damage? Do blizzard conditions exist: winds 35 mph or more AND visibility ¼ mile or less? What is the height and diameter of the branch, limb or tree that was broken or blown down? Was the tree healthy or decayed? What type of tree was damaged, e.g., hardwood or softwood? Is the damage to a well-built structure or a weak outbuilding? What is the main building material for the structure: wood, brick, metal, concrete, etc.? If the structure is a mobile home, was it anchored down? Report the size of the largest stone and any damage. To estimate size, compare hail to well known objects such as coins or balls, but not to marbles, or measure the hail with a ruler.